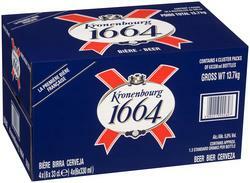 Introducing Kronbenbourg 1664, the premium lager of Brasseries Kronenbourg, brewers since 1664. With a history dating back more than 300 years combined with a passion for brewing there is no wonder Kronenbourg 1664 is France's no. 1 selling beer and the UK's second-biggest selling beer and the UK's second-biggest selling premium lager. Kronenbourg 1664 is made with a unique blend of hops including aromatic bitters from alsace.